UniMovies is a campus club afiliated with UOWPulse. Founded in 1971 as the Wollongong University College Film Group, the club's sole aim is to provide state-of-the-art presentations of popular mainstream and limited release films for the University community. We have a management committee consisting of some 12 people, currently mostly staff of the University and graduates working in the district who are still interested in supporting the University. (We do want students involved.) This is the group of people patrons will see every screening, selling and collecting tickets and serving in our snack bar, all on a voluntary basis. The committee is elected from the members of the club who pay an annual fee. Where are we? 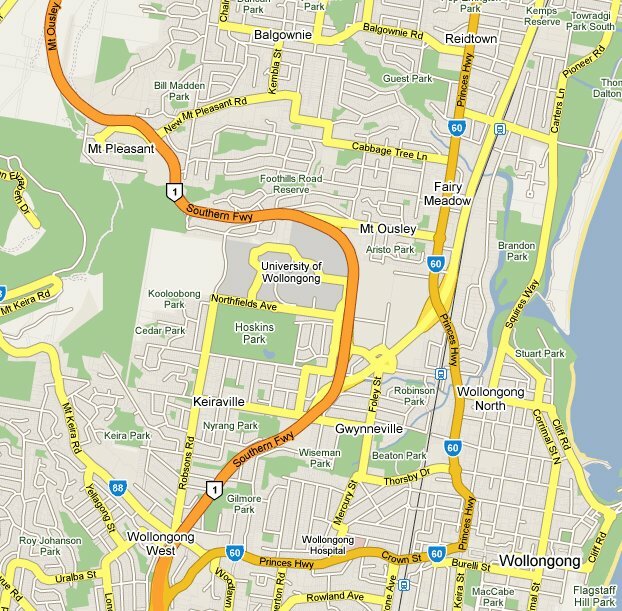 The University of Wollongong is located about 80km south of Sydney, NSW. 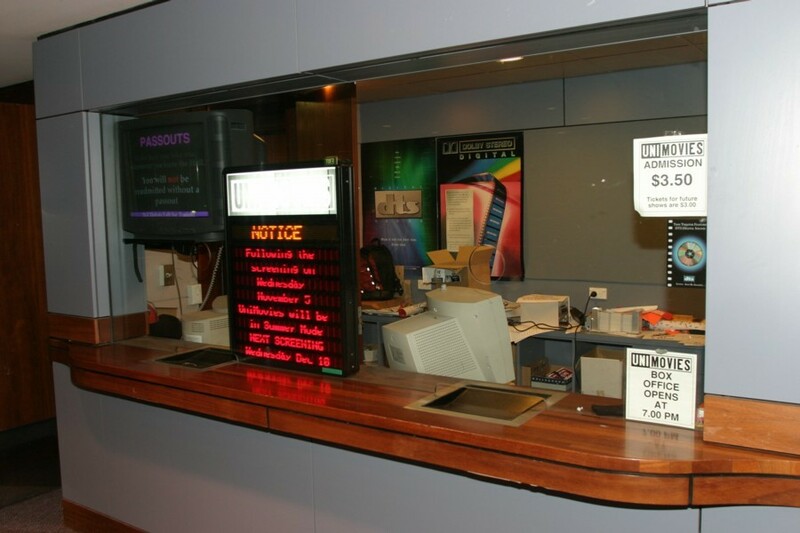 Wollongong and environs has 19 commercial screens spread over 4 cinemas - three chain complexes (a 3-plex and an 8-plex both operated by Greater Union, and a 6-plex operated by Hoyts) and a twin independent(Gala). The city's other independent cinema, the Regent, closed in 2004. 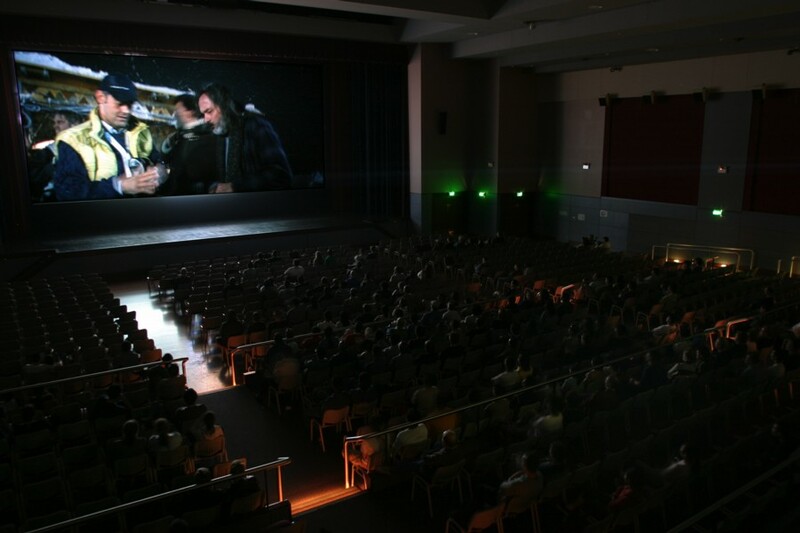 UniMovies presents screenings in the University Hall, a multi-purpose venue built in 1993. 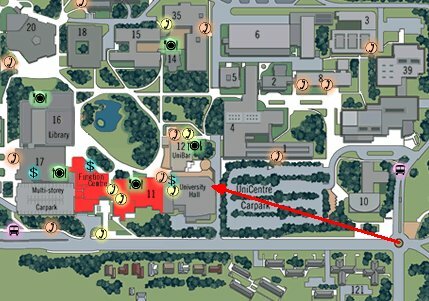 A map of the local suburbs can be found here, while the venue's relative location to the main road passing the university is shown here. 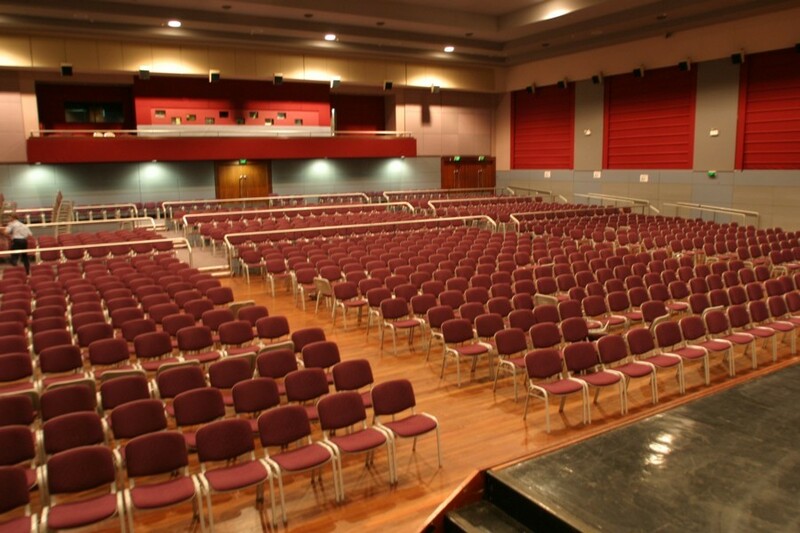 It seats over 700 in cinema mode, and has three levels to provide the clearest sightlines possible in a flat floored venue. 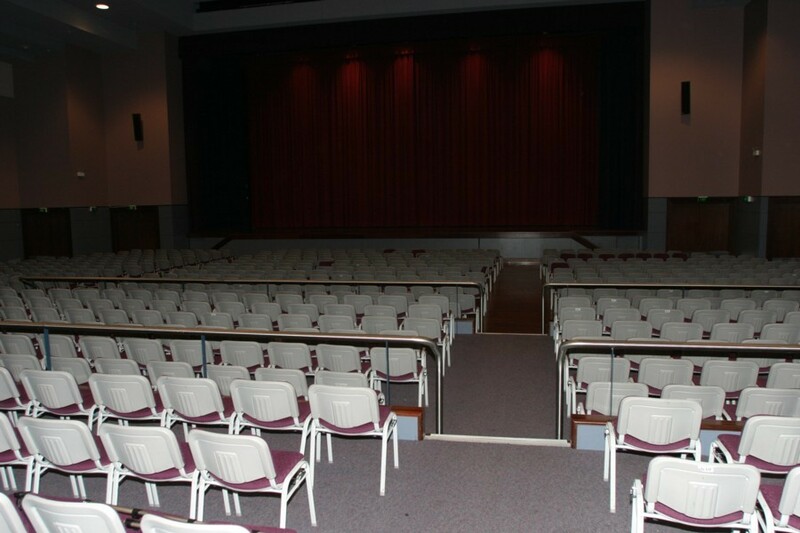 Pictured below are views looking towards the front and the rear and a computer-enhanced shot of the audience enjoying a recent show (prior to the refursbishment in 2018-19). How often? All year, UniMovies strives to screen every Wednesday night, although the fact our venue is used for other purposes means it is no longer guaranteed that we screen every Wednesday. We also utilise available Thursdays or Fridays for other screenings, including the occasional arthouse, foreign language or documentary feature. How much? Admission to any screening is currently $6 if tickets are purchased at the Unishop or a prior screening in advance of the box-office opening, and $7 on the night of the show, or online via our website. We have no surcharge for 3D features. 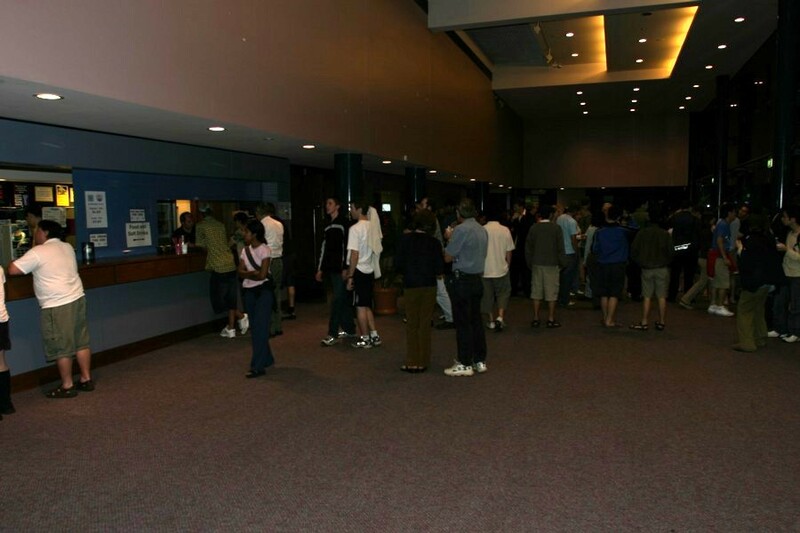 Up to 2006, many screenings sold out, sometimes even before the box-office opened. However, due to changes in the manner in which the University charges for parking during the day, students do not frequent campus activities as much, so attendances have been more than halved. For the regular moviegoer there is an alternative. Membership As mentioned earlier, UniMovies is a club. As such, anyone can join and become a member. As from 2019, we have two forms of membership. GOLD membership is available to anyone for an annual fee of $80, and covers the period from the first day of Autumn Session (about the beginning of March), to the same time the following year. Once a GOLD member, you are entitled to free admittance to all screenings by UniMovies. So if you attend about 40% of our screenings, you'll be ahead. The new form of membership is SILVER membership, available only to current UOW students at a cost of $30. 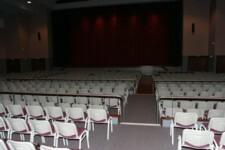 SILVER membership only provides the member with free admission to 10 shows. The membership is still for the same period. Note that membership is not transferable. Both forms of membership provides you with the right to vote at meetings and run for the Management Committee. Members can enter the venue five minutes earlier than the rest of the patrons. Application forms for membership are available at any screening. Front of house Our box-office opens 30 minutes prior to the scheduled screening time, at the same time as our doors. 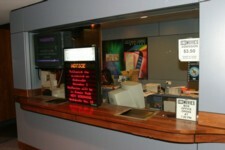 We have a computerised ticketing system which sells from the box-office or the UniShop. We also have a refreshment bar where our volunteers will serve you soft drinks, fresh-brewed coffee, hot chocolate, tea, crisps, M&Ms and Maltesers. We also sell imported ice-cream called Dippin' Dots (all the way from Paducah, Kentucky). The refreshment bar is available only until the feature starts, so make sure you arrive in time to stock up before the scheduled starting time. Patrons are allowed to bring their own refreshments. However, hot food and glass containers are not allowed in the venue. 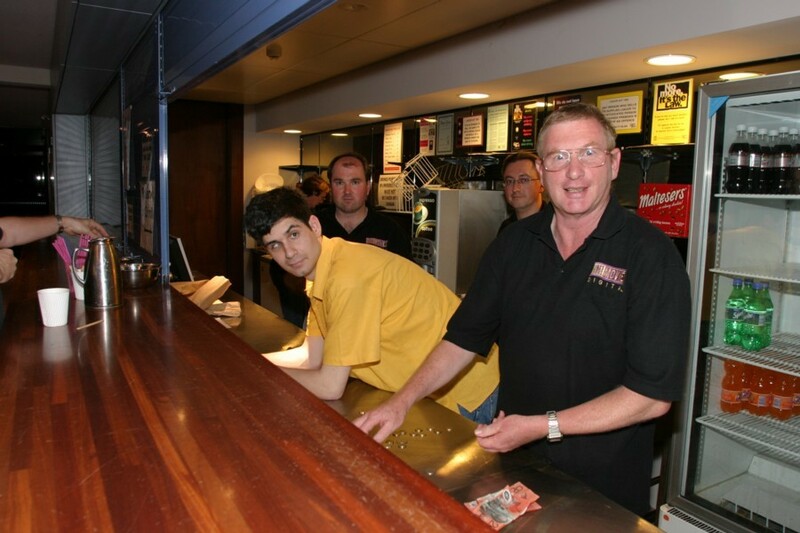 Also alcoholic drinks purchased at the UniBar are not permitted due the University's licence. Here are pictures of our foyer, box-office and refreshment bar. Equipment Since 2009, there has been a dramatic change in the way cinemas show movies. At that time, our projection equipment consisted of a Kinoton FP-25E 35mm projector, using 4000 watt projection lamps, and Eprad make-up tables. The integrated Kinoton film tower provided the facility to present all films as one continuous show. However, since 2009, UniMovies has been fully digital, originally using an NEC1600C-A. 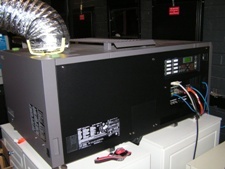 This was updated in late 2012 to an NEC 3240, with a 7000 watt lamphouse and 4K resolution. 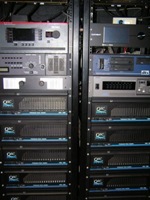 We currently have a GDC SX2000AR digital server, and a Datasat AP20 sound processor providing full 7.1 digital sound. The screen is the largest in the area at 15m with a height of 6.8m. We regularly check to ensure that our picture satisfies the standard brightness of 14 footlamberts (tested with our Harkness brightness meter). And we also have digital 3D, with a system utilising imported shutter glasses. Pictured below is our NEC3240 dCinema projector, plus pictures of our current amplifier rack and input rack. 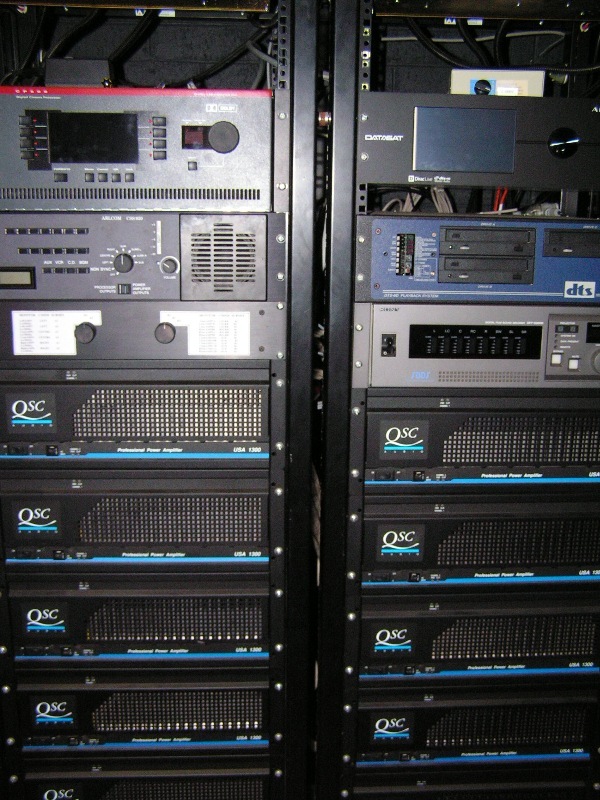 Our amplifiers are 12 QSC 385-watts per channel stereo amplifiers feeding bi-amped ElectroVoice/Krix screen channel speakers (each with twin horns to cover the large venue), 6 ElectroVoice subwoofers, and 24 Krix surround speakers. Legacy 35mm sound processors can also be seen. 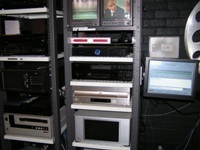 Also below is a picture of our input rack housing players for digital cinema, BluRay and DVD plus HD digital television. Again, some legacy players are also still present.